The story of Ilam Hall is typical of many country houses. It was built on the riches of industry and became a showy country retreat for two prominent men. However, the advent of the 20th-century marked a rapid and quite remarkable decline in its fortunes. The Ilam estate stands on land that used to be part of Burton-on-Trent Abbey. Around it sweeps the rich and lovely Vale of Ilam embellished with hanging woodland and views towards the swelling hills of limestone around Dovedale. At its extremity are the River Hamp and River Manifold, which after taking separate subterranean courses emerge and unite to form a wide river at the valley bottom. Following the Dissolution of the Monasteries the land passed to William Paget, Principal Private Secretary to the King, who sold the manor to John Port in 1547. The Port family built a Tudor mansion on the ridge over the river and remained there for the next 250 years. In the end, its isolation probably contributed to its downfall. In 1809 the house and estate was sold to David Pike Watts, an extremely wealthy brewer and vintner, of Portland Place in London. 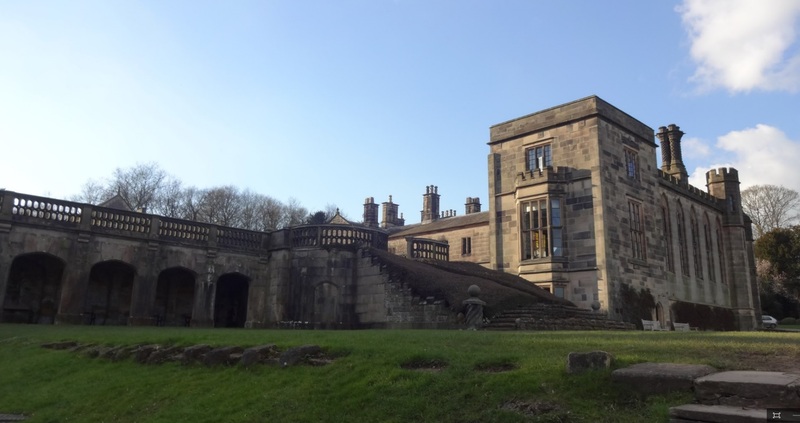 His daughter and heiress, Mary (1792-1840), married Jesse Russell in 1811 and here the story of Ilam Hall really begins. Jesse Russell was the son of Mr Jesse Russell, a successful soap boiler of Goodman’s Yard, Minories, residing at Walthamstow, and Elizabeth Russell, the daughter and heiress of Mr Thomas Noble, of Boroughbridge, in Yorkshire. 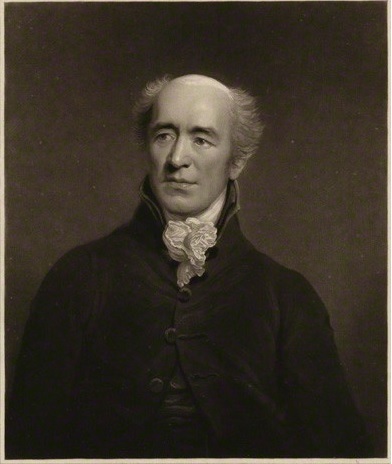 He was educated at Worcester College, Oxford, and took his Bachelor’s degree in 1808, presiding his Master of Arts in 1811 as a ‘Grand Compounder’. Russell appears to have taken little interest in his father’s business and by the time of his marriage was resident in Staffordshire. 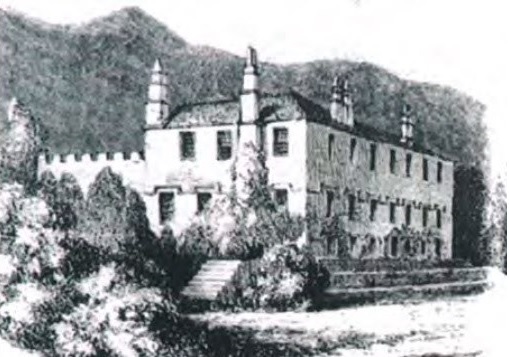 The newly-weds made Ilam Hall their principal home and inherited the property on the death of David Pike Watts in 1816. From here on Jesse Russell adopted the Watts name by Royal Licence and by this marriage had four daughters and four sons. He became High Sheriff of Staffordshire in 1819. 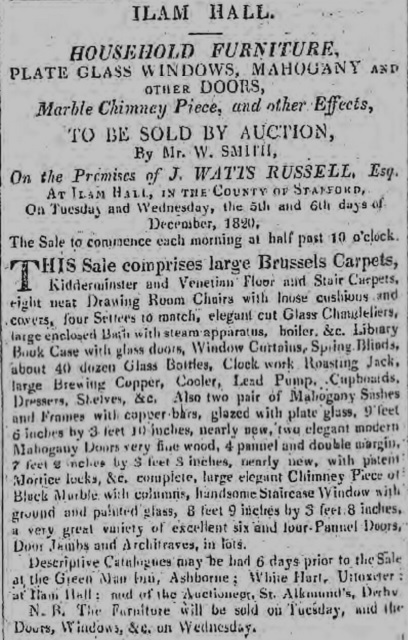 On the death of his father in 1820, Jesse Watts-Russell was a very wealthy man. He inherited half-share of estates in Essex and a third-share in the remaining fortune. In the same year he became the M.P. for Gatton. 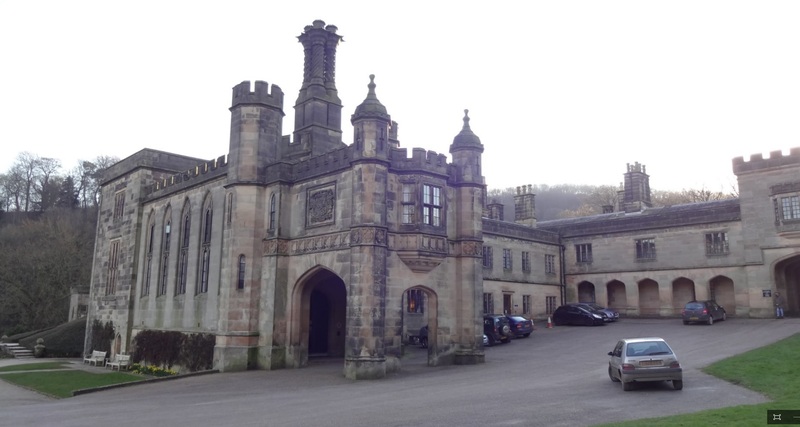 Combining the two family fortunes he made plans to build a new house at Ilam to compete with the Earl of Shrewsbury’s grand house at Alton Towers. The first part of the process was to clear Ilam Hall of its historical contents. In November 1820 he auctioned household furniture and fittings including chimney-pieces, plate glass windows and doors.² Later he commissioned James Trubshaw (1777-1853) to build a new hall to the designs of John Shaw (1776-1832). Work commenced in 1821 and was completed by 1826. 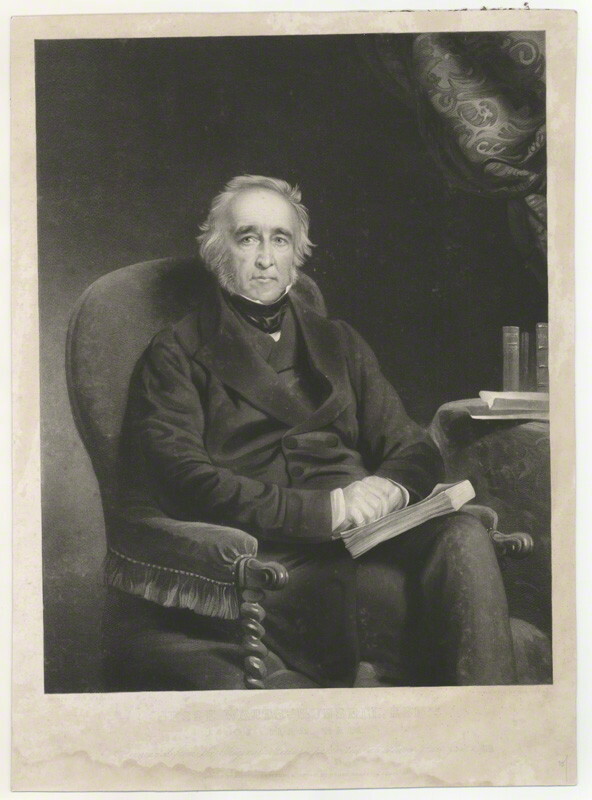 In 1832 Jesse Watts-Russell put himself forward in the Conservative interest for North Staffordshire but was defeated by Sir Oswald Mosley and Sir Edward Buller. It was a gallant and determined fight and his supporters later descended on Ilam Hall to present him with a silver candelabra which stood four feet high. Mary Watts-Russell died in 1840 but Jesse Watts-Russell would marry twice more. In 1843 he married Maria Ellen, daughter of Peter Barker of Bedford and, in 1862, Martha, daughter of John Leach of Wexford. Ilam Hall, along with estates in Derbyshire and Northamptonshire, passed to his eldest son, Jesse David Watts-Russell (1812-1879). However, the former M.P. for North Staffordshire, preferred the family’s other country house, Biggin House in Northamptonshire, and promptly made plans to dispose of Ilam Hall. In August Ilam Hall was auctioned but failed to sell. Bidding started at £50,000 and reached £73,000 before stalling and promptly withdrawn. 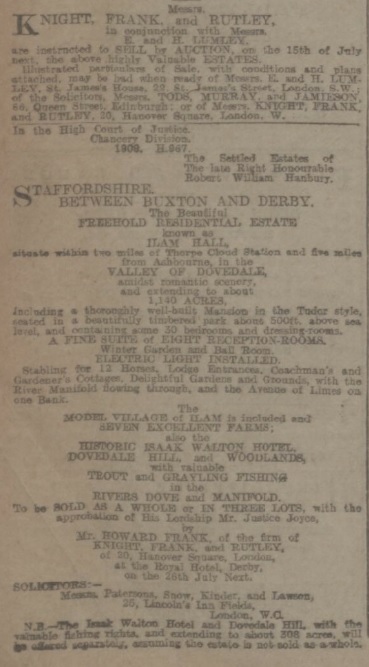 The presence of a private buyer in the background might have influenced the decision because, on the same day, the Staffordshire Journal was reporting that Ilam Hall had been bought by Mr Robert Hanbury, the M.P. for Tamworth. Robert William Hanbury was the only son of Mr Robert Hanbury and Mary Anne, of Bolehall House in Warwickshire. He was educated at Rugby and Corpus Christi College, Oxford, with adeptness at rowing. He had captained the Corpus boat when it was head of the river. A man of importance he was a magistrate and Deputy-Lieutenant for Staffordshire, Derbyshire and Warwickshire. From 1873 until 1880 he was a Captain in the Queen’s Own Royal Regiment of the Staffordshire Yeomanry. He sat as the M.P. for Tamworth between 1872 and 1878, a seat he vacated to become the short-lived M.P. for North Staffordshire. He would later become the elected M.P. for Preston in 1885. 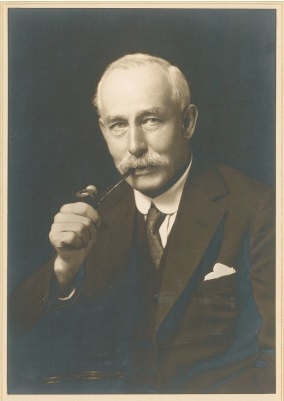 In 1895 he was appointed Financial Secretary by Lord Salisbury but the pinnacle of his parliamentary career was being made President of the Board of Agriculture and a place in the cabinet in 1900. In 1874 Mr Hanbury made the overland tour to India by the Euphrates and Tigris, a route not often taken. The journey through Asia Minor was carried out with comparative ease. Dervish Pasha, the Ottoman War Minister, placing at his disposal a troop of Turkish cavalry, to protect his caravan from possible attacks by marauding Arabs. Robert Hanbury married Ismena Tindal, daughter of Thomas Morgan Gepp of Chelmsford, in 1869. She died in 1871 and he later married Ellen Hamilton Knox. Hanbury was a man of wealth. He was the son of a country gentleman of ample fortune, and was left fatherless at an early age. Much of his wealth derived from collieries around Cannock Chase and he could now claim to be Lord of the Manor at Norton Canes, Ilam and Calton in Staffordshire. The fact that Hanbury spent most of his time in London meant he took no part in local affairs and only sat on the local bench on two occasions. However, he used Ilam Hall to entertain political and other friends and was held in high esteem by farmers of the district. This was partly due to his role as Chairman of the Board of Agriculture for which he laboured for the domain of farming. His stay at Illam Hall was one of improvement. He carried out a comprehensive scheme of electric lighting, power being obtained from the River Manifold. Hanbury’s plan was to power the hall, farm buildings, the church and the nearby village. He also improved the gardens and would personally supervise planting schemes and garden layouts. Hanbury’s second marriage to Ellen Hamilton, the only child of Colonel Knott Hamilton, took place in 1884. This marriage, like his first, produced no children, but the couple settled down to life in London and at Ilam. In April 1903 Hanbury returned to his home at Belgrave Square, London, after a short visit to Preston. The following day he entertained friends but left the dining table feeling ill. Dr Jones, his medical adviser, arrived shortly after and pronounced that Hanbury was suffering from a severe attack of pneumonia and influenza. A week later he grew much weaker and died on 28th April. At Ashbourne, where he was entitled to sit as a Magistrate, flags were flown at half-mast in recognition of the man. Hanbury’s coffin was conveyed from Herbert House, in Belgrave Square, to Ilam and remained in the spacious hall covered with floral tributes. The funeral was mainly a local affair attended by villagers, tenants and farmers. The coffin was carried from the hall by twelve employees from the Coppice Colliery, Cannock Chase, in which Hanbury held a large interest. His body was finally laid to rest at Ilam Church, a stone’s throw from the house. Robert Hanbury left personal estate to the net value of £104,667 (£204,000 at gross value) but the executors, his wife Ellen Hanbury and Charles Fisher, of the Coppice Colliery, would face difficult times ahead. Robert Hanbury’s coffin had barely been in the ground before widow Ellen Hanbury found herself a suitor. The fellow in question was Victor Henry Bowring (1867-1943), a close family friend who had attended the funeral. 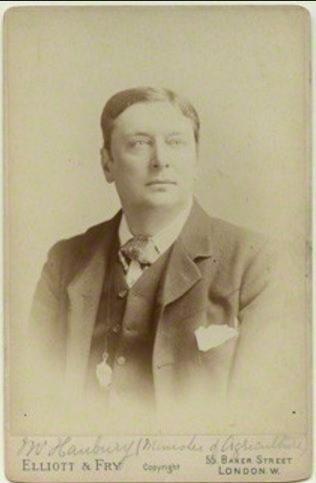 Bowring was the youngest son of Edgar Alfred Bowring, past M.P. for Exeter and former librarian and registrar to the Board of Trade as well as a former Royal Commissioner of the Great Exhibition of 1851. His grandfather had been Sir John Bowring whose adventurous career had been full enough for half a dozen lives. He had been kept in prison by the Bourbons in 1822 and after the French Revolution of 1830 had been the first Englishman received by Louis Philippe. He became Envoy and Minister Plenipotentiary to China, and involved Britain in the war with the Celestial Empire. On his way home he had been shipwrecked, and spent three days on a coral island without food or shelter before being rescued. He spent the rest of his days writing poetry and prose. When his marriage to Ellen Hanbury was announced in February 1904 it was regarded as one of the most fashionable weddings of the year. It would appear that Ellen Hanbury needed clarification as to her obligations to Robert’s seven nieces. We can only speculate as to the circumstances leading to the court action. Had the seven nieces wanted to benefit from Hanbury’s death or were they simply protecting their own interests? After all, provision had been made for them in his clumsily worded will, and the presence of Victor Bowring might well have been seen as a threat to any entitlement that they had a legal right to. The will was subject to scrutiny and after several court cases ended up in the Appeal Court. The ruling was that Robert Hanbury had left his property absolutely to the widow without giving a reversionary interest to his nieces, leaving their future participation to the widow’s discretion. The wedding took place at St Peter’s Church, Eaton Square, on Tuesday 16th February 1904. Despite being billed as one of the most anticipated weddings of the year it was attended by only twelve people. Ellen Hanbury wore a deep diamond collar and brooch which was reputed to have once belonged to Marie Antoinette.¹º Afterwards the party attended an informal reception at the Hyde Park Hotel. From now on the couple would be known as Victor and Ellen Bowring-Hanbury. In December 1905 the Bowring-Hanbury name hit the headline again. This time it was news that Ellen Bowring-Hanbury had been robbed of £8,000 worth of jewellery while waiting with her maid at Euston Station for the train to take them back to Staffordshire. 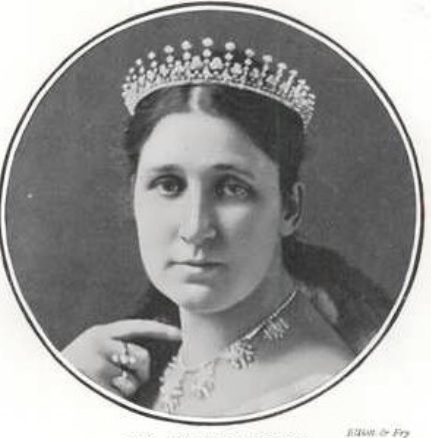 Among the items was a diamond tiara given to her by Robert Hanbury. The train had left London when the loss was discovered and after all efforts to find the jewels failed, the train was stopped by means of the communication cord. 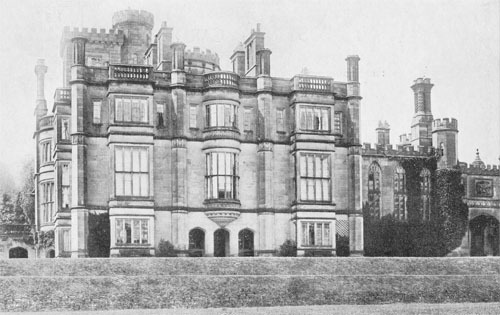 Ilam Hall, however, remained a sticking point, and the couple would remain at the house until 1926. By now Ellen was an invalid and ill-health forced Victor to be virtually house-bound. Every year he would make the long journey to Brighton for a few months but seldom left the house. Victor and Ellen-Bowring left Ilam Hall and took up residence at 5 Belgrave Square. 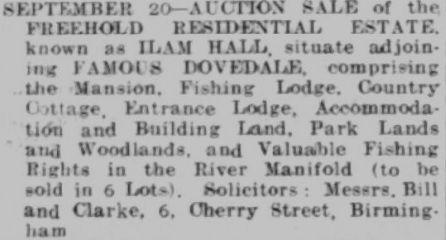 It was another year before Ilam Hall was finally sold by private treaty. Ellen Bowring-Hanbury died in March 1931 leaving unsettled property to the value of £26,395. The residue of her property went to Victor Bowring-Hanbury who went on to sell parts of her art collection, among them some ten pastels by Dunkarton, and works by Gainsborough Dupont, Hickel, Hurter, King and Morland. 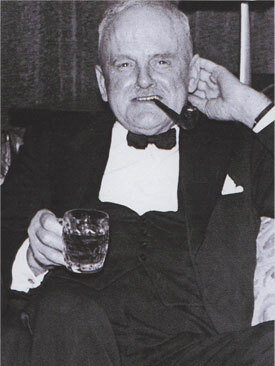 Victor Bowring-Hanbury became a ‘society sensation’ of the 1930’s. The house at Belgrave Square contained old masters, rare china and old furniture, which he valued at over £150,000. However, some of the collection had been collected without the means to pay for it. In 1935, while Victor was spending the day at Ascot, part of the collection was seized for a debt of £5,000. 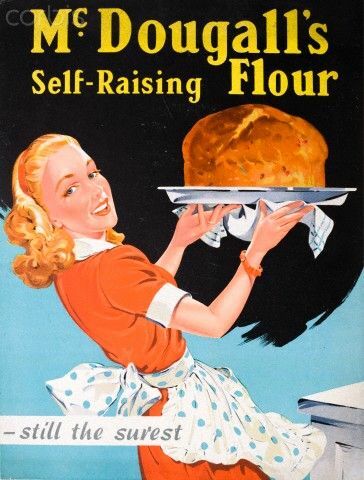 Soon after he declared bankruptcy and was discharged in 1938. Fortunately for Victor, two women friends had bought up a large number of his confiscated lots, and duly returned them before his death in December 1943. 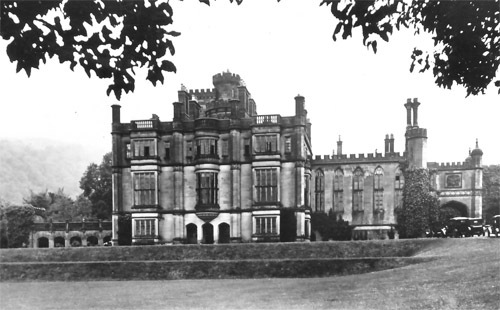 In April 1927 Ilam Hall was bought by Edward C.S. Backhouse for an undisclosed fee. Backhouse had been one of the bidders in the August 1926 auction and frustrated when his bid was rejected. 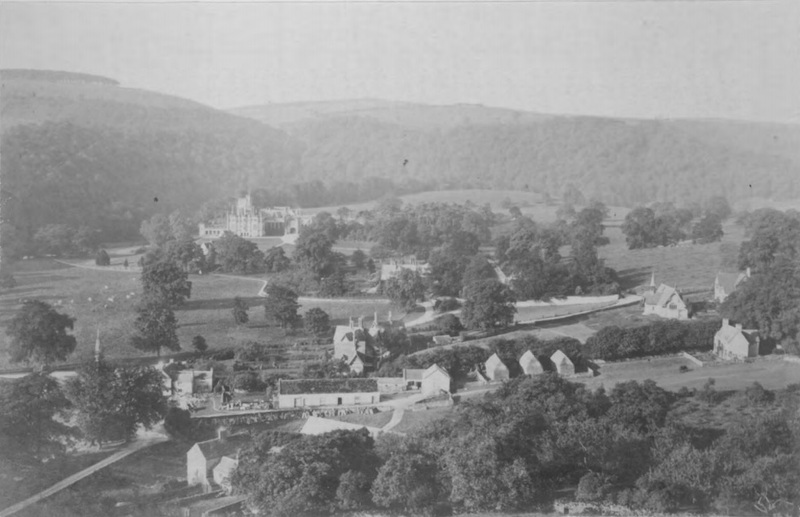 However, he eventually managed to get ownership of Ilam Hall as well as the nearby Izaak Walton Hotel. He converted parts of the house into a restaurant with plans to develop the grounds into an amusement park. The restaurant was advertised with ‘excellent catering at popular prices’ and encouraged customers to send for ‘our menus of satisfaction’. A hotel opened in the hall soon after. 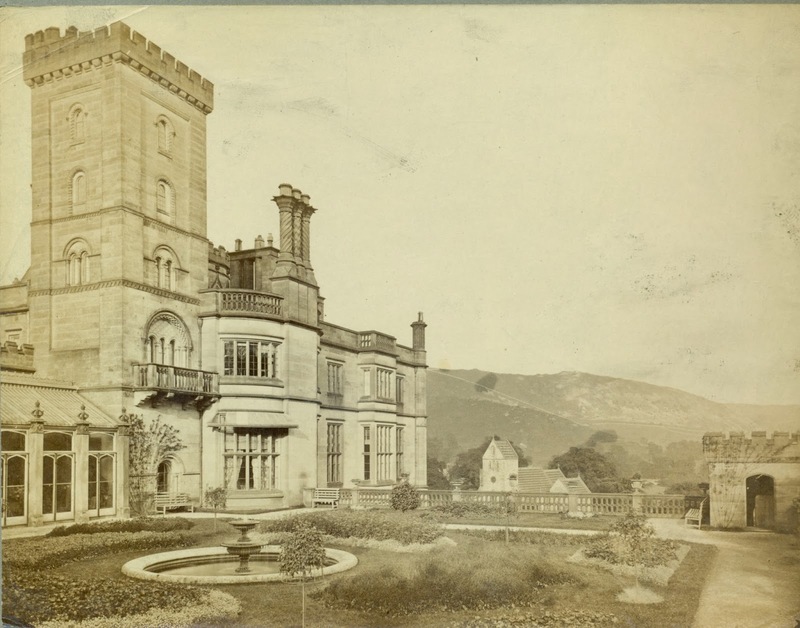 By 1930 Ilam Hall was advertised with an 18-hole miniature golf course, archery, dancing in the ballroom to popular bands such as the British Legion Band, and an invite to visitors to see the ‘priceless massive oak 15th-century fireplace and underground rivers’. Later advertisements showed that visitors were also able to play tennis. Ilam Hall and its grounds were open daily from April and newspaper advertisements showed that popular coach companies like Bartons and the Trent Motor Traction Co were including the hall in their motor excursions. 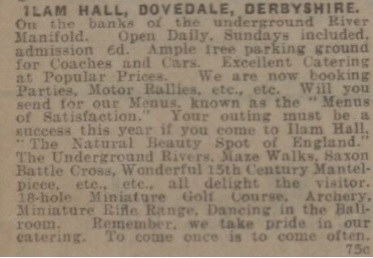 Ilam Hall’s location in its beautiful Dovedale surroundings must have been welcome relief for the working classes of Derby, Nottingham and Stoke-on-Trent. However, quite how successful Mr Backhouse’s business venture proved to be is open to question. 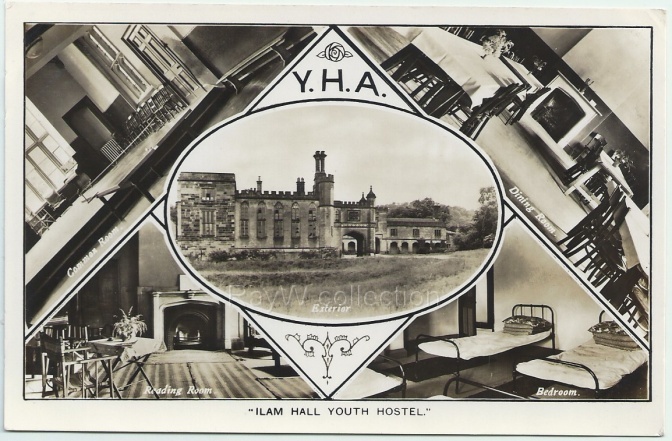 In 1932 the North Midlands Regional Council of the Youth Hostels Association rented the right wing of Ilam Hall. The plan was for four dormitory bedrooms accommodating ten men and ten women. In addition there was a large common room, kitchen, cooking apparatus and shower baths for the residents. The intention was to attract hikers, ramblers and cyclists who regularly visited the beautiful countryside around Ilam and Dovedale. The interest shown in the youth hostel was not lost on Edward Backhouse. The YHA, doubtful that the number of beds was insufficient, were relieved when he agreed that any overflow could be lodged in the main hall, having decided upon a special low tariff for hikers and cyclists. He also offered meals for guests if required. Quick to see a business opportunity he was soon telling people to ‘Make Ilam Hall your holiday centre’. With summer occupancy at capacity the YHA didn’t bargain for the isolation and severe weather conditions that affected the peaks in winter. Quite unsuitable for winter accommodation the hostel closed and was not brought into use again. The new owner of Ilam Hall was William Twigg, a constructional engineer from Matlock, who paid £1,600. If Edward Backhouse had failed to turn a profit on Ilam Hall then William Twigg was well qualified to do so. Born in 1881, the son of a farmer, he had developed an interest in second hand plant and machinery. In 1905 he borrowed money to buy Slack Quarry in Ashover and later set up business buying and selling old quarry machinery. He would later buy the Manifold Valley Railway from the L.M.S. Railway Company, including nine miles of track, railway engines and stations, and immediately sell it at a profit to a rival bidder. 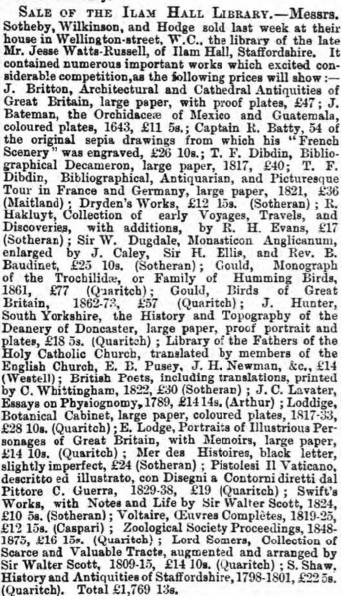 With regard to Ilam Hall the reasons for his purchase were quite clear. In the 1920’s Twigg had bought Wingerworth Hall from the Hunloke family and stripped the flat roof of 50 tons of lead, which sold for £1,500. In addition he spent two years stripping and selling the interiors making a handsome profit in the process. (This massacre of a fine old house has been described as ‘recycling’ by some modern-day observers.) Once stripped of anything salvageable the house had eventually been demolished. William Twigg, satisfied he had taken whatever riches Ilam Hall offered, declared he would look for a quick sale on the property. If unsold by the start of 1934 he said he would have no hesitation in demolishing the entire building. 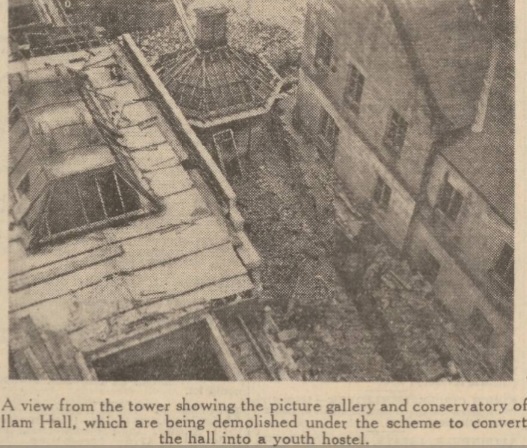 History books state that demolition was well under way by the time Robert McDougall bought Ilam Hall in June 1934. This is untrue but the house was in such a sorry state that demolition might have been the cheapest option. McDougall was keenly interested in social and philanthropic work and, in 1933, gave £20,000 to the Society of Friends for a scheme providing allotments for the unemployed. He had bought up large swathes of Dovedale and gifted it to the National Trust. He contested the High Peak division for the Liberals without success on three occasions and would be appointed the unpaid Deputy Treasurer at the University of Manchester. In 1937 he would be knighted for social and philanthropic work in the Coronation Honours. McDougall bought Ilam Hall and 20 acres of grounds for a nominal fee with the intention of saving this once grand house. His first task was to gift it to the City of Stoke-on-Trent but, after careful consideration, the council rejected the offer. 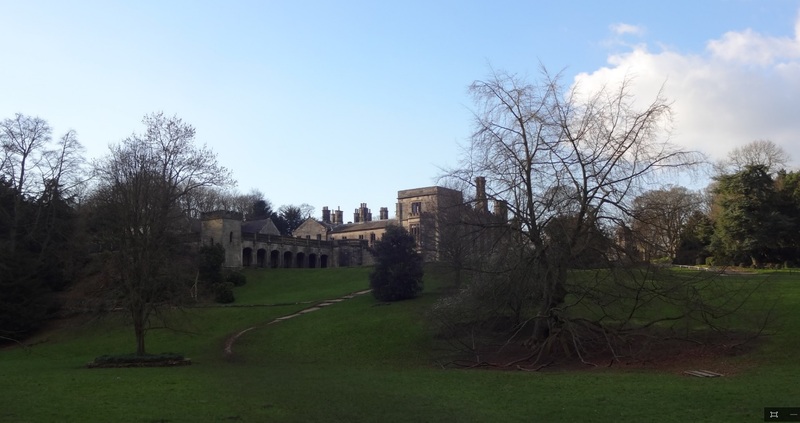 McDougall’s second option was to donate Ilam Hall with its woodlands and parkland to the National Trust. The cost of this project, with central heating and hot and cold water for 150 people, was estimated at more than £3,000. Part of the plan was the demolition of the greater part of Ilam Hall allowing the old house – built c1600 – to be exposed to view. This meant only the formal entrance, service wings and estate buildings would survive from Jesse Watts-Russell’s house. Work began immediately and projected for completion in May 1935. 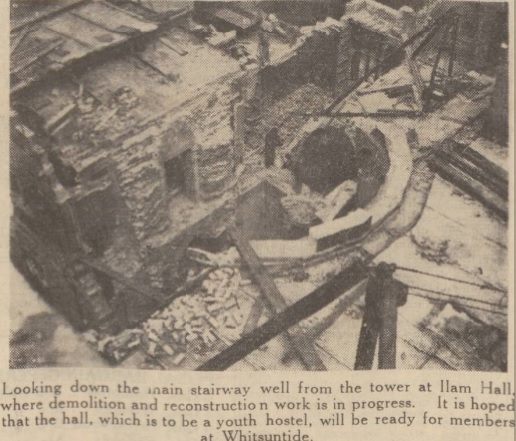 However, complications meant the youth hostel did not open until September when it was officially opened by Mr William A. Cadbury of Birmingham. As well as Robert McDougall, cash gifts were given by the W.A. Cadbury Trust and the Carnegie Trust. 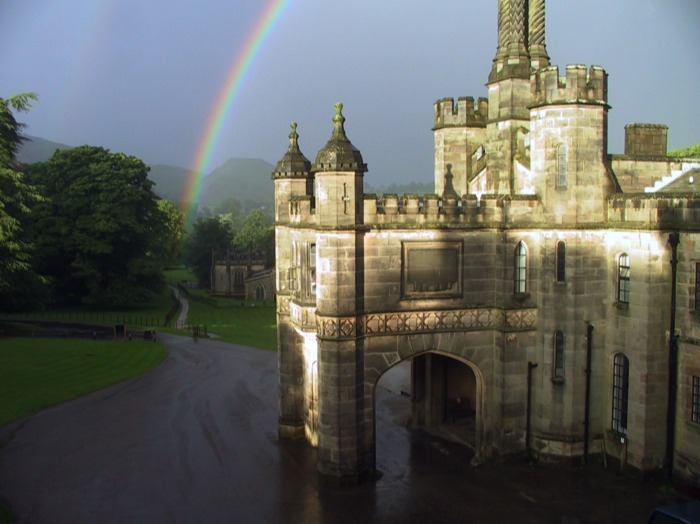 It became the largest youth hostel in England with the entrance hall and east wing adapted for the purpose. With the youth hostel proving extremely popular, the arrival of the German Youth Orchestra in March 1938 did not detract from future events. The orchestra, consisting of 35 men and 15 girls, played a programme of folk dances and songs as well as classical works. The concert was recorded for broadcast on the BBC Midland Regional service. In December 1938 Sir Robert McDougall died. After a business meeting in London he hailed a taxi outside Mansion House Station but on arrival at Euston Station was found unconscious in his seat. The driver drove to the National Temperance Hospital where it was found that he was dead. 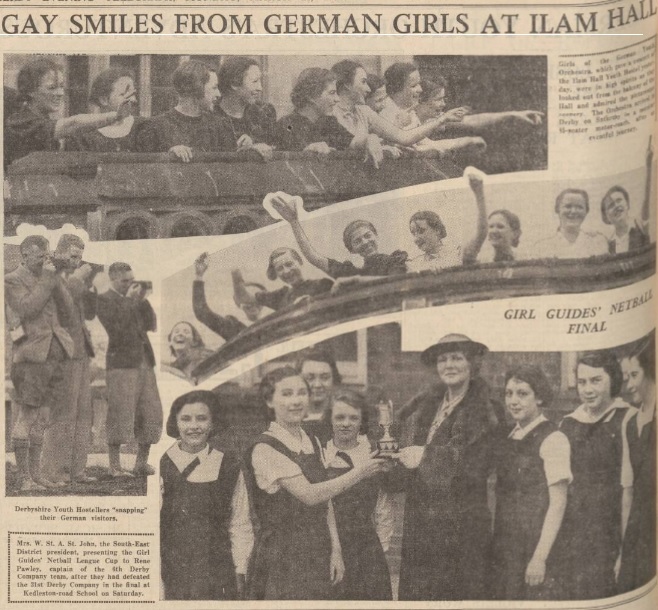 With the outbreak of World War Two the YHA activities at Ilam Hall slowed down. The house was instead used to house a party of 29 Czech refugees, mainly clerical and engineering workers, from Sudetenland. As the Germans plundered the countryside and villages the British Committee for the Refugees from Czechoslovakia had offered them refuge in Britain. The refugees had to be accommodated elsewhere over the Easter weekend as the hall had been booked up months in advance by people wanting to use the youth hostel. In May, now numbering 38 people, they were moved to Farley Hall, a residence owned by Major C.F. Bill, near Oakamoor and close to Alton Towers. 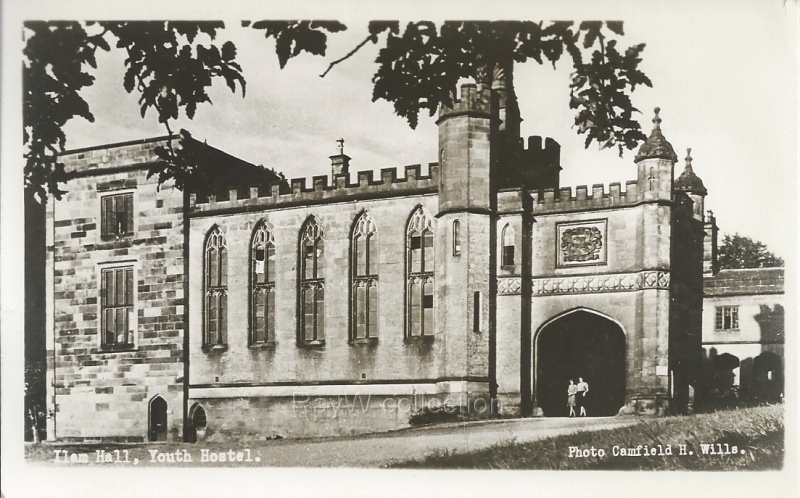 The war had forced the YHA to seriously reconsider their position and by September Ilam Hall had closed indefinitely. The house was used to accommodate a party of blind people evacuated from Derby for ‘national purposes’.²² They stayed at Ilam Hall until 1943 when the Derby Health Committee decided to return them to Derby. At the end of the war Ilam Hall once again reopened as a youth hostel and still remains in use to this day. 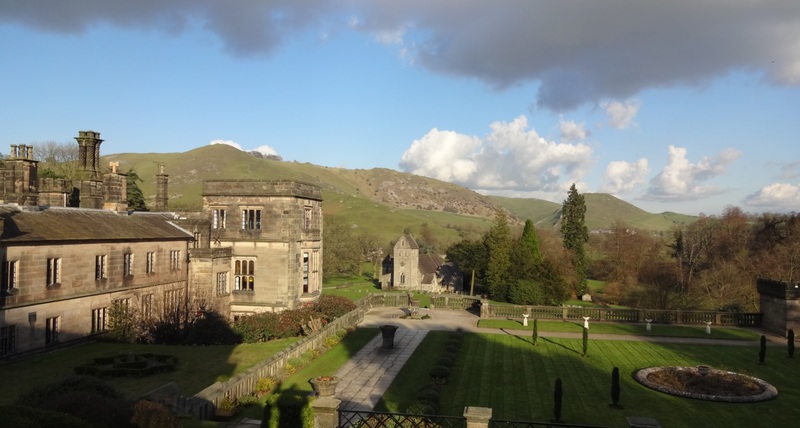 It stands in Ilam Park which, alongside Dovedale, both gifted by Sir Robert McDougall, are managed by the National Trust. All above courtesy of the British Newspaper Archive. Notes on William Twigg were provided from ‘William Twigg – a successful and caring company’ by Brian Hall. The company, bearing William Twigg’s name, still survives. William Twigg (Matlock) Ltd provides steel fabrication, steel stock holding and hardware and plumbing supplies. We have learned that Jesse Watts-Russell built Ilam Hall to emulate the glories surrounding Alton Towers, the home of the Earl of Shrewsbury. The attempt by Edward Backhouse to create an amusement park at Ilam Hall compared with similar plans taking shape at Alton Towers around the same time. Ilam Hall’s inaccessibility meant the project was always doomed to failure, thankfully so for lovers of the countryside. As for Alton Towers, the rest is history! 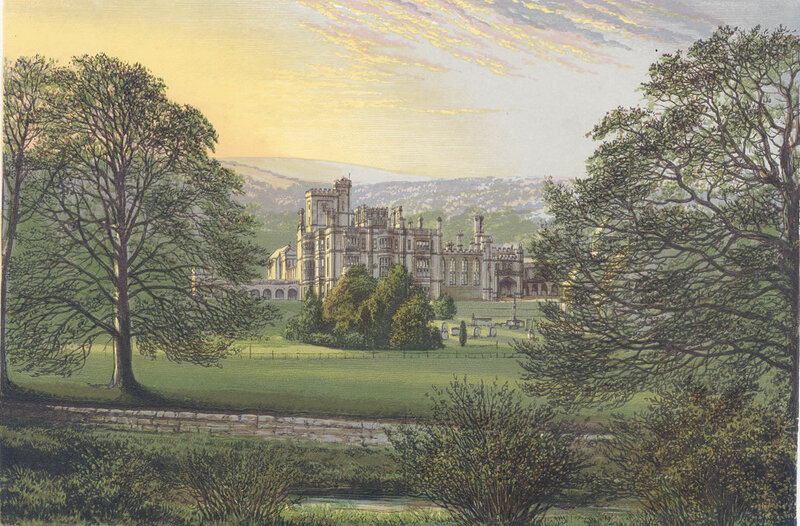 In the end, both houses were lost in some way or another – Ilam Hall partly demolished and Alton Towers becoming a monumental ruin – but still exist in vastly different circumstances. Some might say that Ilam Hall has come out of it the best of all.